It seems like only yesterday we were saying that the US Marines are looking for new mobile energy solutions, when along comes the US Air Force to up the ante. The Air Force has just nabbed bragging rights to the largest fleet of electric vehicles in the world with vehicle-to-grid capability, demonstrating yet again that the big fuss over the proposed Keystone XL tar sands oil pipeline is getting sillier by the minute, considering that it’s just another 20th century fossil fuel transportation project in a 21st century world. That US Marines thing involves portable solar, so let’s see how EV vehicle-to-grid (V2G) technology is going to work for the Air Force. Electric vehicles with V2G capability at Los Angeles Air Force Base (courtesy of USAF/Sarah Corrice). 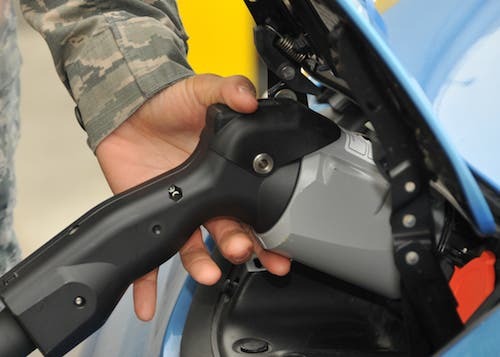 The new Air Force V2G/EV fleet was unveiled last week at Los Angeles Air Force Base, making it the first Defense facility — actually, the first federal facility of any kind — to replace all of its general-purpose vehicles with plug-in EVs. According to the Defense Department, it’s also the largest operational V2G demonstration in the world. The fleet consists of 42 vehicles, including sedans, pick-up trucks and minivans. 36 of them will be V2G-capable, which means that they can discharge power onto the utility grid to improve power quality and temporarily relieve congestion. That V2G thing is a little more complicated than it looks. 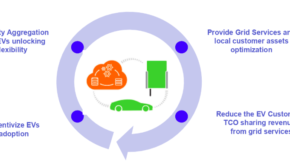 It’s one thing to manage V2G in a self contained microgrid, but when you’re talking grid connection that requires a lot of legwork. To get the regulatory platform set up for V2G, the Air Force partnered with the State of California and Southern California Edison, in addition to collaborating with the Army, Navy and Marine Corps, and various stakeholders in academia and the private sector. The partnership will also include additional research and development of V2G technologies aimed at modernizing (there’s that 21st century thing again) the Defense fleet overall. The immediate goal of the V2G program at Los Angeles AFB is to enable the facility to pitch in and help prevent brownouts in the region, by using the vehicle batteries to balance out supply and demand. To be clear, the aim of converting domestic bases to V2G/EV capability isn’t just to be better neighbors. The Air Force’s interest in 21st century tech also extends to expeditionary forces. That’s right, the new fleet of a few dozen vehicles is just for proof-of-concept. Los Angeles AFB is the first pilot project in a program that will encompass Fort Hood, Joint Base Andrews, Joint Base McGuire-Dix-Lakehurst and Mountain View Army Reserve Center, for starters. According to DoD, the Air Force is also looking at the potential for repurposing worn EV batteries for use in stationary energy storage (Ford is already exploring that angle, btw, as is Sumimoto Corp.). Those of you who have been following the debate over fuel cell EVs and battery EVs are probably noticing that there is a big empty hole in this V2G thing, namely, where do you suppose all that electricity is coming from? The problem with both fuel cells and batteries is that while we’re in this transitional period, a lot of the supply chain for both types of EV still involves fossil natural gas and coal. Not to worry, it looks like Los Angeles AFB is a step ahead. We first took note of the V2G changeover about three years ago, back when it was just a glimmer in somebody’s eye, and the facility was already going at solar energy hammer and tongs. Back in 2010 LA AFB began installing solar canopies as part of a broader push for alternative energy and energy efficiency, with the aim of reducing dependence on petroleum, including fuel for its ground vehicle fleet. Unlike private industries, which make their economic decision based on the immediate profit margin, government institutions can look ahead into the future when planning for an energy-saving project. The bottom line is to spend the available budget the best way possible. Other aspects of the “greening” of LA AFB include a deal with our friends over at SolarCity to put rooftop solar panels on housing at the facility (LA AFB is just one part of SolarCity’s “SolarStrong” initiative for military housing, btw). For the record, let’s also note that the Air Force is also looking into renewable sources for jet fuel, most notably for its Green Hornet fighter jet.